Peripheral arterial disease is a prevalent disease affecting 8 million Americans and is associated with significant morbidity like intermittent claudication, critical limb ischemia and limb loss. Interventions for peripheral arterial disease have recently moved towards more endovascular procedures compared to traditional surgery. Primary approach for such endovascular procedures remains common femoral artery either contra-lateral or ipsi-lateral. Although commonly used, access via the common femoral artery (CFA) is associated with significant risk of access site bleeding, hematoma, retro-peritoneal bleeding, psuedoaneurysm and A-V fistula. Also, the more commonly used contra-lateral CFA approach has technical challenges especially with tortuousity/occlusion of the iliac arteries. Pedal artery access has been described previously by many operators as an alternative to groin access. Currently, this approach is usually reserved as secondary option after failed antegrade approach or as an adjunct for complex lesions in patients with critical limb ischemia. This can be attributed to many factors including risk of occlusion of artery accessed (specially in cases of single-vessel run off), lack of dedicated instruments, spasm and effective hemostasis methods. Here we describe our new technique and experience with first 80 patients who underwent invasive management of PAD via sole pedal access as the primary approach. Under ultrasound guidance using a 21 gauge needle DP, PT or peroneal artery was accessed either by counter-puncture or direct puncture method (Fig 1). Micropuncture wire is advanced under fluoroscopic guidance and if needed contrast angiography is performed to visualize the vessel anatomy. Once access is secured, a 4F sheath is advanced partially in the vessel (fig 2). At this time vasodilators such as nitroglycerine (100mcg) and verapamil (2.5 mg) are administered intra-arterially and heparin is administered intravenously. A 4F 125cm hydrophilic catheter pre-loaded with 0.018” wire is then advanced retrogradely to the bifurcation of aorta. Contrast angiography is performed. If a lesion is identified prior to reaching bifurcation, angiography is performed and attempt is made to cross the lesion with the 0.018” wire. If needed interventions such as orbital atherectomy (1.25 burr) and balloon angioplasty (fig 3) are performed via the 4F sheath. If a stent is required, the sheath is upgraded to a sheath with 5F outer diameter which accommodates 6F equipment and using the 6F catheter stents are delivered (fig 4). Hemostasis is achieved via a modified patent hemostasis technique similar to the trans-radial procedure. 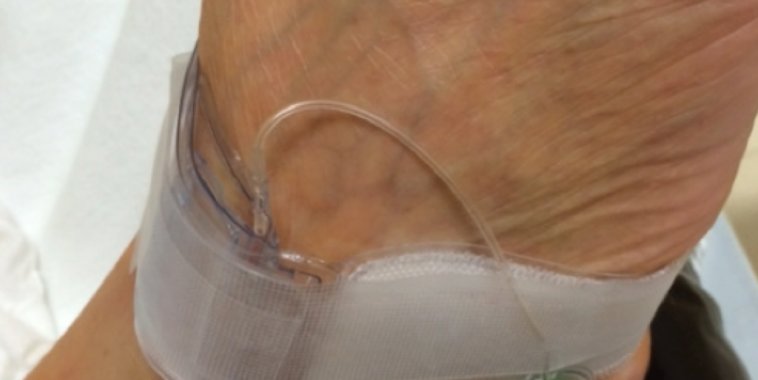 A trans-radial band is applied at the access site and the balloon is inflated to 15-20mmHg while the sheath is removed at the same time (fig 5). If there is no bleeding from access site, air is removed slowly from the balloon to release the pressure on the artery until bleeding is observed. Once bleeding is noticed at the access site, an additional 1-2 cc of air is used to inflate the balloon so that the bleeding stops. This allows having sufficient pressure to achieve hemostasis without occluding the blood flow through the artery. The band is kept in place for 30 minutes and then slowly decompressed over 5-10 minutes and removed if no bleeding is observed. Patients are allowed to mobilize at this time. Access site patency is checked. Our practice is to evaluate the access site with clinical examination by the physician at 1 week and with duplex ultrasound at 1 month. We recently presented our data of consecutive 80 patients approached via this novel technique. Access was successfully obtained in 74 (92%). A total of 8 (10%) patients required femoral access for various reasons including failure to obtain pedal access, spasm or need for additional support. Out of 80 patients 51 patients required intervention of which 45 (88%) were performed via pedal access only. Most notably there were no complications in these patients. Access site evaluation at 1 month was available in 71 of 74 patients accessed as 3 patients were lost to follow up. All 71 patients had patent access site and no complications were observed. Primary pedal access may be a safe and feasible alternative to traditional femoral approach. Pedal access has several advantages. Reduced rate of complications associated with femoral approach. Reduced procedure time. (less tortuosity compared to contra-lateral femoral approach). Reduced radiation exposure due to shorter procedure time and less scatter radiation from lower extremity compared to abdomen. Shorter recovery time and early ambulation may increase patient comfort. In published literature major retrospective case series have explored different methods of retrograde approach. Recently Mustapha et al described their technique in a case-series of 23 patients who were thought to be high risk of groin complications as primary approach. They had no access site complications similar to our study. Walker et al described the largest reported case series of 228 CLI patients with retrograde approach after failed antegrade approach. In this series there was one access site occlusion and two pseudo-aneurysms requiring covered stent placement (1.3% complication rate). Montero-Baker and colleagues had described 51 cases, including 6 claudicants, with pedal access after failed antegrade approach and reported 1 access site occlusion, two perforations and hematomas. Our technique is extrapolated from our extensive trans-radial experience as interventional cardiologist and learning curve might be longer for those who lack these skills. Also pedal access has limitations including significant lesions in below the knee arteries which may require treatment prior to approaching lesions above the knee. In our limited single center experience primary pedal approach seems safe and feasible. In future further analysis with comparison to femoral approach will shed more light on superiority of this approach. Our access site success, rate of complications and procedural success is in line with previously reported case series utilizing retrograde approach. Allison MA, Ho E, Denenberg JO, Langer RD, Newman AB, Fabsitz RR, Criqui MH. Ethnic-Specific Prevalence of Peripheral Arterial Disease in the United States, Am J Preventive Med 2007;32(4):328-333. Botti CF, Jr., Ansel GM, Silver MJ, Barker BJ, South S. Percutaneous retrograde tibial access in limb salvage. J Endovasc Ther 2003;10:614-8. Montero-Baker M, Schmidt A, Braunlich S, et al. Retrograde approach for complex popliteal and tibioperoneal occlusions. J Endovasc Ther 2008;15:594-604. Mustapha JA, Saab F, McGoff T, et al. Tibio-pedal arterial minimally invasive retrograde revascularization in patients with advanced peripheral vascular disease: the TAMI technique, original case series. Catheter Cardiovasc Interv 2014;83:987-94. Rogers RK, Dattilo PB, Garcia JA, Tsai T, Casserly IP. Retrograde approach to recanalization of complex tibial disease. Catheter Cardiovasc Interv 2011;77:915-25. Walker C. Pedal access in critical limb ischemia. J Cardiovasc Surg (Torino) 2014;55:225-7.